Who would have thought that a little known French director and his two French stars could do a silent movie and turn it into a hit in the days of everything electronic and computerized? The Artist turns the world upside down and proves that you don’t need 3D, CGI, and other fancy electronic tricks to make a spell-binding movie. It is refreshing to sit in a darkened movie theatre and be at one with your senses and emotions. We learn there are other ways to communicate rather than with words. Between the actors’ expressions and the mood of the music we have no problem understanding what is happening on the screen. The audience is taken through a wide range of emotions and by the end of the movie we realize we have experienced hubris, joy, happiness, sadness, fear, tragedy, pathos, loyalty, and much more without a single word ever spoken. 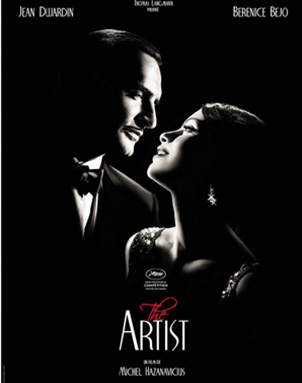 The Artist parallels the decline of a silent movie star with the rise of a young starlet at the beginning of talkies. The movie begins in 1927 when George Valentin, a dashing and somewhat narcissistic silent movie star, literally bumps into Peppy Miller, a young woman eager to break into the movies. They are immediately attracted to each other and he becomes responsible for her big break by insisting she be in his next movie. The Artist then jumps ahead to 1929 when the whole world changes. George Valentin is informed by the studio head, Al Zimmer (played by John Goodman), that talkies are the future. Valentin laughs at this prospect and walks out to write, direct, and finance his own movie. As fate (and old movie melodramas) would have it, his movie, and that of his protégée’s, Peppe Miller, both premier on October 25. Her movie is a big hit while his flops drastically leaving him financially ruined. In addition, we all know what else happened the end of October 1929. The great depression hits sending Valentin into a deep alcoholic depression of his own. I won’t go into any more plot detail because I would like the reader to go see the movie for yourself, however, it is safe to say that, as in any good old-fashioned movie, we have to have a happy ending. The movie has already won a lot of awards and is guaranteed to win more before the awards season is over. It is nominated for 10 Academy Awards including Best Picture, Best Director, Best Original Screenplay, Best Actor in a leading role, and Best Actress in a supporting role. Jean Dujardin, who plays George Valentin, seems to have a rubber face as he goes through a wide range of emotions. Berenice Bejo is appropriately perky and peppy in her portrayal of Peppy Miller. And, John Goodman is bigger than life as he plays the cigar- chomping, studio boss. Although each actor is excellent, I must say my favorite is Uggie the Jack Russell dog. He is Valentin’s faithful companion and provides the comic relief. The director, Michel Hazanavicius, has successfully made a beautiful homage to movies. He said he had fantasized about making a silent film for years because many of the filmmakers he admires emerged in the silent era and because of the image-driven nature of the form. He chose the form of the melodrama because he felt that many of the films that had aged best were melodramas. He did extensive research about 1920s Hollywood and studied films to find the right techniques to make the story comprehensible without having too many intertitles to explain the actors unspoken words. Throughout the movie I couldn’t help but make comparisons to famous actors and scenes from the past such as Charlie Chaplin, Douglas Fairbanks, Jr., Valentino, Citizen Kane, Orson Welles, and many more. The Artist is a visual masterpiece with just the right amount of highlights and shadows to make a scene memorable. It is also a joy to sit back and listen to the score which dances around our emotions evoking every feeling possible and then crescendoing to an unforgettable climax. The Artist is more than just a work of art it is a work of genius. It is a must see for any serious movie buff, lover of the arts, or anyone tired of loud crash’em up, bang’em up movies. It is a breath of fresh air in today’s hectic world. Thanks for the reblog. I invite my readers to check out your site to see a work of art in progress.